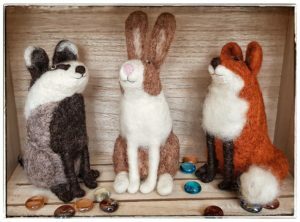 Needle felting is a very satisfying and enjoyable activity that require enough concentration to engage your mind in what is known as the ‘flow state’ which switches off the mind chatter and engrosses your attention on what you are doing, often losing all sense of time. Sometimes it’s nice just to switch off and have fun! The workshop will be held on Saturday 1st June starting promptly at 10am and finishing at 1pm. After this you are welcome to move to the main bar area at Alchemy to have a drink or some lunch and finish your creation. This is also a good opportunity to have a social time with your fellow class mates. You could even drink yourself to a cocktail or two! Suitable for complete beginners, you will be using coloured wool batting and specially barbed felting needles to make the animal of your choice. 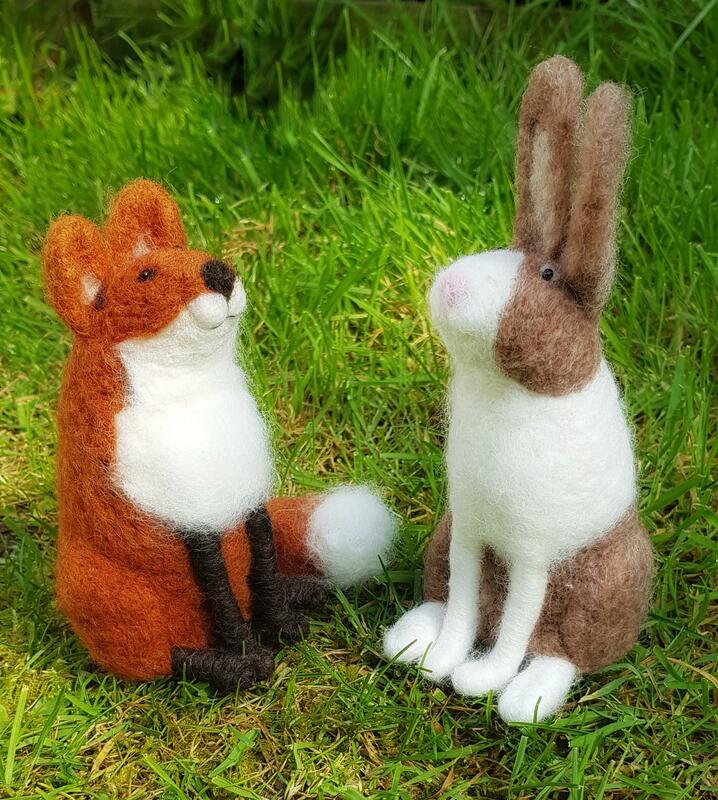 You will be able to take your finished fox, badger or rabbit home to either give as a gift or keep for yourself. * A brief overview of the different grades of felting needles and how to use them safely. * Discover different ways you can use the wool to create shapes and learn how to wrap around a wire. * Learn how to build the core shape for the body and how best to use the wool batting effectively to build up a firm base to work upon. * Learn how to wrap wire with wool and secure to the body. What you will take away on the day? The confidence and enthusiasm to build upon what you have learned so you can build upon your knowledge to make other small animals and 3D objects. There will be some wool selections packs and needle felted animal kits available on the day should you wish to purchase additional materials or try making the other animals at home. Cost of Workshop is £45. All the materials, tools and equipment needed for the workshop are included. You just need to bring yourself. Lots of giggles and excitement as you see your little creature taking shape! Transport and parking options. Parking is free in residential streets. All buses going up Gloucester Road stop at the bus stop just by Alchemy. Bus numbers are: 75, 76, 73 and 72. Cars can drive to the back of the workshop space to drop off but have to leave immediately and find street parking. The workshop takes place in the Downstairs Gallery at Alchemy 198 a café bar so food and drink are available to purchase on site. Soups are vegan organic and bakery products on offer include Joe’s Bakery sourdough. A range of hot drinks and alcoholic drinks including cocktails are on offer. Tutor Elaine is mum to 3 children and keeper of an assortment of furred and feathered pets! She has always been creative and gained a BA(hons) Degree is Multi Media Textiles in 2000. She went on to work for Mencap running art and craft sessions within a day centre, which she thoroughly enjoyed!